In the preceding example, replace https://example.execute-api.us-east-1.amazonaws.com/v1/register with the Invoke URL that you obtained in Step 4.3. When a user submits this form, it triggers a Lambda function that calls several Amazon Pinpoint API operations. Malicious users could launch an attack on your form that could cause a large number of requests to be made. If you plan to use this solution for a production use case, you should secure it by using a system such as Google reCAPTCHA. After you publish the form, you should submit some test events to make sure that it works as expected. In a web browser, go to the location where you uploaded the registration form. If you used the code example from Step 5.1, you see a form that resembles the example in the following image. Enter your contact information in the First name, Last name, and Phone number fields. When you submit the form, Amazon Pinpoint attempts to send a message to the phone number that you specified. Because of this functionality, you should use a real phone number to test the solution from beginning to end. If you tested the Lambda function in Step 3, your Amazon Pinpoint project already contains at least one endpoint. 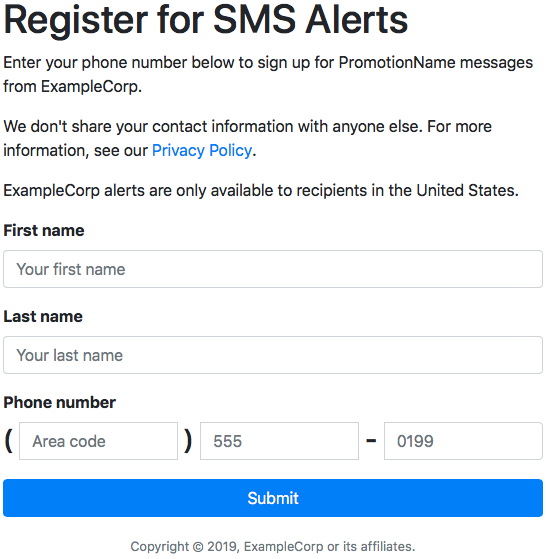 When you test this form, you should either submit a different phone number on the form, or delete the existing endpoint by using the DeleteEndpoint API operation. Check the device that's associated with the phone number that you specified to make sure that it received the message. In Segment group 1, under Add filters to refine your segment, choose Filter by user. For Choose a user attribute, choose FirstName. Then, for Choose values, choose the first name that you specified when you submitted the form. The Segment estimate section should show that there are zero eligible endpoints, and one endpoint (under Total endpoints), as shown in the following example. This result is expected. When the Lambda function creates a new endpoint, the endpoint is opted out by default. On the device that received the message, reply to the message with the two-way SMS keyword that you specified in Step 1.3. Amazon Pinpoint sends a response message immediately. In the Amazon Pinpoint console, repeat steps 4 through 8. This time, when you create the segment, you see one eligible endpoint, and one total endpoint. This result is expected, because the endpoint is now opted in.